The Plaza on Oxford Street is probably one of the most depressing places to eat in London. Harshly lit, with uncomfortable seating, there is no enjoyment in the place whatsoever. Signs on every surface constantly hector you to take your trays away and to clear your table. Only food purchased in the food hall may eaten there, as if anyone would visit purely to experience the atmosphere. You are reminded not to smoke. You are informed that you are being monitored on CCTV. I bought a Big Mac meal from McDonalds. ALL CREW: Strives to satisfy customers; Consistently follows procedures and adheres to standards; Takes initiative and ownership; Demonstrates and promotes teamwork; Carries out job functions within McDonald’s QSC and time standards; Uses antimicrobial handwash for 20 seconds every hour, uses McD hand sanitizer every 1/2 hour. Greet customer, take order assemble order, receive payment, present order, thank customer and ask for repeat business. Places baskets of fries in vat, activates and deactivates computer, shakes and drains basket, empties fries, salts fries, bags fries, places fries in holding rack, rotates packages, monitors equipment, keeps work station clean, assists operation another station drawing drinks, reports malfunctioning equipment, knows procedures for fire, robberies or accident. Greets customer at drive-up/takes orders, complete cash transaction, may recall order on P.O.S. for single booth operation, suggestive sell when appropriate, ask customer to proceed to next window, thanks customer, assembles order, present order. Acknowledges production quantity of specific product, removes product from freezer, observes correct shelf life of all raw products, for grilled product; lays meat patties, uses timer, seasons, removes from grill and places in Universal Holding Cabinet (UHC), for fried product; loads portions into baskets, places baskets in fryers, activates computer, drains cooked product, places in UHC. Starts the fabrication process in the grill area, immediately responds to Kitchen Video System (KVS), pulls correct buns, biscuits or muffin, toasts buns, places in correct packaging or wrap, attaches special orders to packaging, pushes product to assembler who; dresses sandwich neatly with correct condiments, adds meat, chicken, fish or egg, wraps or closes packaging, places on heated landing pad. Keeps area cleaned and stocked with product, condiments and packaging. Prepares required amount of raw products using plastic gloves, assembles salads using usage charts, places salads at refrigerated rail, closes salads securely and transfers to cooler, cleans and sanitizes preparation area, observes correct shelf life of all raw products, knows proper visual characteristics of raw and unfinished products, monitors equipment, knows emergency procedures. Monitors stockroom and backroom security, keeps floor and stairway clean, keeps backroom, storage, and sink area organized, keeps walk-in clean, acts as a support person for production (i.e. changes syrup, syrup tanks, meat supply, ice), assists lobby person as requested (changes trash liners, floor cleanliness, bathrooms), keeps outside lot clean, (trash bins, windows, sidewalks, signs, playland equipment), assists in stocking maintains towel supply, unloads supplies from transporter. “Universal Holding Cabinet”, “Kitchen Video System”. I love learning about phrases like this. I like the sound of the “Initiator/Assembler” role. “What do you do?” “I initiate burgers”. So anyway, of course, when they say “There is only one Big Mac”, there are in fact lots of Big Macs, but there is only the McDonalds Big Mac. 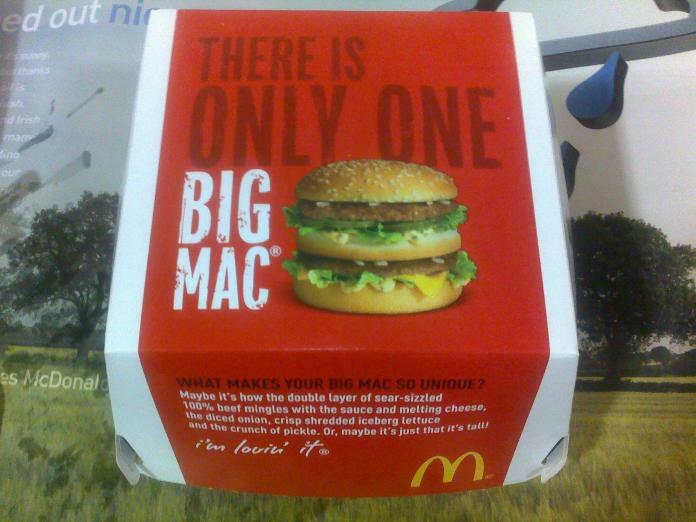 There is no other Big Mac. That’s what they mean. WHAT MAKES YOUR BIG MAC SO UNIQUE? As much as I can accept the “There is only one Big Mac” thing, I draw the line at this. What makes my Big Mac so unique? Nothing. 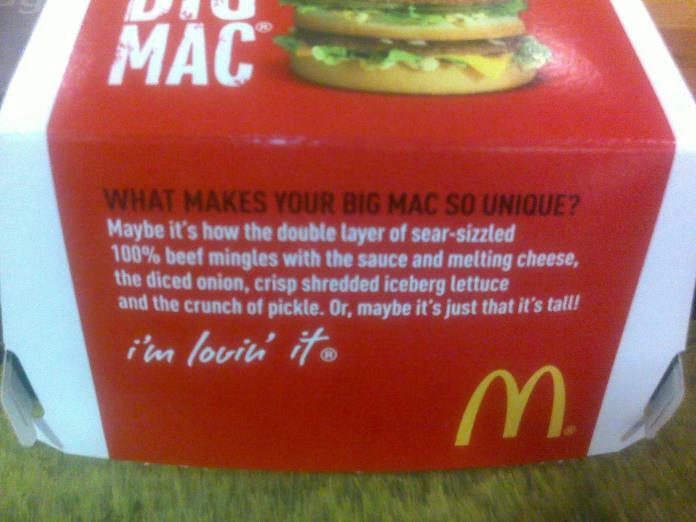 They mean “What makes Big Macs so unique?”. There was nothing unique about my Big Mac. My Big Mac had been initiated and assembled in the exact same way as every other Big Mac in the world (allowing for some small regional variations). The double layer of sear-sizzled 100% beef mingled with the sauce and the melting cheese and the diced onion and the shredded iceberg lettuce and the crunch of pickle in my Big Mac in the same way that the double layer of sear-sizzled 100% beef mingled with the sauce and the melting cheese and the diced onion and the shredded iceberg lettuce and the crunch of pickle in the Big Mac that the man in front of me bought, and the other Big Macs waiting on the heated landing pad in the McDonalds at The Plaza on Oxford Street, and all the other Big Macs waiting on all the heated landing pads in the world. I don’t even want a unique Big Mac. That’s the point. James, why do you have to take everything so LITERALLY? In her seminal work “The Commodification of Indviduality” Karen Lipskill suggests the paradox of consumerism is its incorporation of our individual identities into the industralisation of the personal. Whereas throughout the nineteenth century objects and people represented themselves through their very existence, in the twentieth century identity became dependent on labels and packaging. Now, in our new century, Lipskill asserts, we live in a world where nothing exists EXCEPT description. Without attachment to the thing it previously referred to. description is free to scale ever higher peaks of meaninglessness. I wonder if Karen Lipskill came up with that theory after eating a Big Mac in The Plaze on Oxford Street. But how many little pen(cil)s do they get through a year? In other – almost related – news, we are now leaving to eat in our local Harvester, with the all-you-can-snarf salad bar. I will check what they call it (I think the Pepsis are “bottomless”). did you have fries with that? Yes, I went for the meal option (regular not large). I had a still Fanta. Surely the point is that you can’t get anything that tastes like that anywhere else? For example your local burger bar might a have a double burger, triple bun, splodged, saladed and begherkined type offer, however it is not a BIG MAC. I liked the diagram of the counter though and will aim to use the term ‘heated landing pad’ next time I drop by. But of course the TM ‘Big Mac’ is unique, I wonder whether the burger itself has some kind of design protection. That would be good, someone out there is a pro-burger-designer. I’d appreciate it if you’d address your analytical skills to the TIR road transit protocol. when you go to mcdonalds, you order “a” big mac, not “the” big mac. that should be relevant, somehow. I feel quite guilty that the thing on this page which made me laugh out loud was when I scrolled down and was unexpected faced with the word ‘buns’. Despite some evidence to the contrary, I fear I may be a 14-year-old boy.